Sakyamuni Siddhartha Gautama was a glorious global gift to humanity. He blossomed forth into the universe to put them on the correct track for their emancipation. Never was there a day an hour or a minute that He thought of Himself but the entire humanity. He discovered the realities of life the eternal bliss the truth of life, the joy of Vimukthi and offered it to the humanity for their liberation from samsara. After the Parinibbana of the Buddha millions of devotees venerated Him in various ways. Chetiya worship was one such method of paying respect to His doctrine of Dhamma. In the Mahaparinibbana Sutta the Buddha is said to have mentioned that there were four classes of people over whose remains stupas or chetiyas should be built such as the Buddhas, Pacheka Buddhas, Arahats and universal monarchs. Further, the Buddha is said to have advised stupas to be built over the relics of the great Theras Sariputta and Moggallana. Hence chetiya worship seems to have existed during the Buddha's time. There is evidence to this effect in Dhammapadattakatha. the practice has been continued and mostly the Buddha's relics were enshrined in chetiyas. After the introduction of Buddhism to Sri Lanka Arahat Mahinda Himself introduced chetiya worship here, so much so that Anuradhapura became known as Atamasthana. As Mihintale was 12 miles away from the capital, King Devanampiya Tissa donated the Mahameghawana gardens to Ven. Mahinda and His mission. Mahavihara was later constructed here and it became the centre of Theravada doctrine with the three great symbols of the Triple Gem, Chetiya enshrining the Buddha relics, the sacred Bo tree symbolising the Enlightenment and the main temple signifying the Maha Sangha. Hence, the Ruwanweliseya, Mahavihara and the Sri Maha Bodhi became the associated places of worship of the Mahavihara and it received the special attention of the kings. In close proximity to the sacred Bo tree is the Dagaba of Mahavihara, Ruwanweliseya, the largest chetiya built by King Dutugemunu, the national hero of Sri Lanka as well as Mahavamsa as mentioned by its author Thera Mahanama. History reveals that it became customary for every temple to have a chetiya, ever afterwards. Chetiyas became so important part of Buddhism mostly due to the fact that the Buddha relics are enshrined in them and Ruwanweliseya is an outstanding example. According to the ancient chronicles the Buddha is believed to have visited Mahiyangana and Nagadeepa and on His third visit He had blessed this sacred site with 500 ascetics. Subsequently, when Thera Mahinda had made an offering of flowers there had been a tremor. When King Devanampiya tissa was anxious to know the reason for this miraculous tremor from the Thera, He predicted that in time to come a stupa will be erected where the Buddha relics would be enshrined and the particular salutation of the earth was in anticipation of the magnanimous event. The King's happiness knew no bounds "I can do it", he replied unhesitatingly. The Thera said there is sufficient sasana work for you to be involved in and therefore the right person to undertake this sacred task will soon appear and he is none other than Dutugemunu Abhaya who will be your grandson. the astonished king preserved a document carved in golden letters in the royal treasury. He also set up a tower with a royal edict inscribed on it on the site where Ratnamali Chetiya will be built. Years later King Dutugemunu seeing the document and the inscription, was impatient until it materialised. Having consulted the Bhikkhus, the sacred task was begun. The determined king first laid the foundation with eight golden bricks, specially made for the purpose witnessing another earth tremor. With the inauguration of the chetiya construction the king is said to have been blessed with heaps of peals, gold and gems. the chetiya was elaborately planned and well laid out. When the "pesale" the platform on which the chetiya rests, was being built, it had sunk repeatedly for three times. the king in dismay, consulted the monks. Their reply was that it was due to their firm determination to instil strength and stability to the blissful chetiya. With the completion of the third Pesale the Chetiya was said to contain within its depth a gem studded Bodhiya with its outspreading branches, all decorated well. A Buddha statue was erected on the backdrop of the Bo tree depicting Mara Parajaya and the consequent enlightenment of the Buddha. The interior was decorated with the sculpture of 16 Buddha statues. it was also covered with the scenes and events from the life of the Buddha giving prominence to Wessantara Jathaka. Finally, a silver bed was prepared and later Thera Sonuttara was requested to get the relics from Nagaloka where it had been safely kept on his return. When the relics were about to be placed on the bed the miracles of Yama Maha Pelahara were seen on the sky and the relics flew spontaneously on to the head of the king. His firm determination was that the Buddha be seen on this perfect setting of the silver bed in the reclining pose which he did see with his own eyes. His shraddah(piety) was overflowing. It is said that there is no other chetiya which could be compared to Ruwanweliseya in the whole universe. King Dutugemunu having achieved his ambition of unifying the island and then becoming the benefactor of Buddhism erected many religious buildings such as Lovamahapaya, Mirisa Vetiya etc., with a magnanimous service to Buddhism. But his versatile genius could not live to see the completion of this magnificent Dagaba-Ruwanweliseya. He passed away at the site while admiring the last stages of the construction. His brother King Saddhatissa who succeeded him is said to have temporarily covered it with cloth to the shape of a Dagaba enabling him to pass his last breath peacefully with his clasped hands on his forehead with 'Sadhu Sadhu' and a sigh of relief. Later, King Saddhatissa had really and truly completed the chetiya to its present position, after fulfilling his brother's ambition. 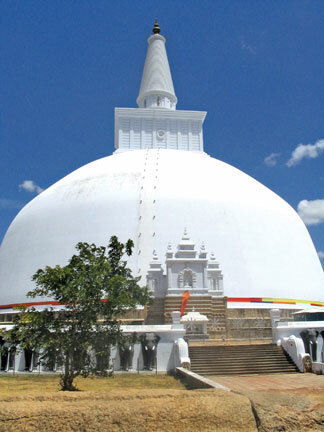 today it lies majestically adding beauty and sanctity to the city of Anuradhapura where our heritage lies. It is one of the main attractions reflecting the past glory and pride of this paradise isle.